THIS INFOMATION IS FOR PRIDE 2018. The Brighton Pride Festival is taking place on Saturday 3rd August in Preston Park. The new community and family LoveBN1Fest will take place on Sunday 4th August. The Saturday and Sunday festivals in the park are part of a much larger weekend of events across the city including the Village Party and Pleasure Gardens. In 2015 we started to fence off the park in stages as we built the site. We realise this isn’t a popular decision for a number of park users and wanted to explain why this happens. In previous years the Pride Festival site would be built whilst the park was completely open, this became dangerous with children running around vehicles and people playing football whilst large structures were being built. Pride take safety very seriously so we worked with the council and our safety team to develop a staggered closure which created safe areas for park users and safe working areas. Friday 27 July: The area in BLUE will be fenced off to allow the load in of the stage to start. Saturday 28 July: A fenced route will be erected for the Park Run to take place. Sunday 29 July: A fenced route will be erected for the Junior Park Run to take place. Pride Community Day & Dog Show is also in Preston Park – come along, it’s free! Monday 30 July: This is the start of the main build, there will be lots of deliveries to the park. The fence line will start to go up around the park. During this time the whole park is accessible but we do advise caution as there will be lots of vehicle movement. Tuesday 31 July:  The fence line will be completed. Area within the red fence line is closed to the public. You will be able to go through the park from north (GATE Y) to the south (GATE K) every morning between 06:30 – 07:45 Tuesday 31 July – Friday 3 August 2018. 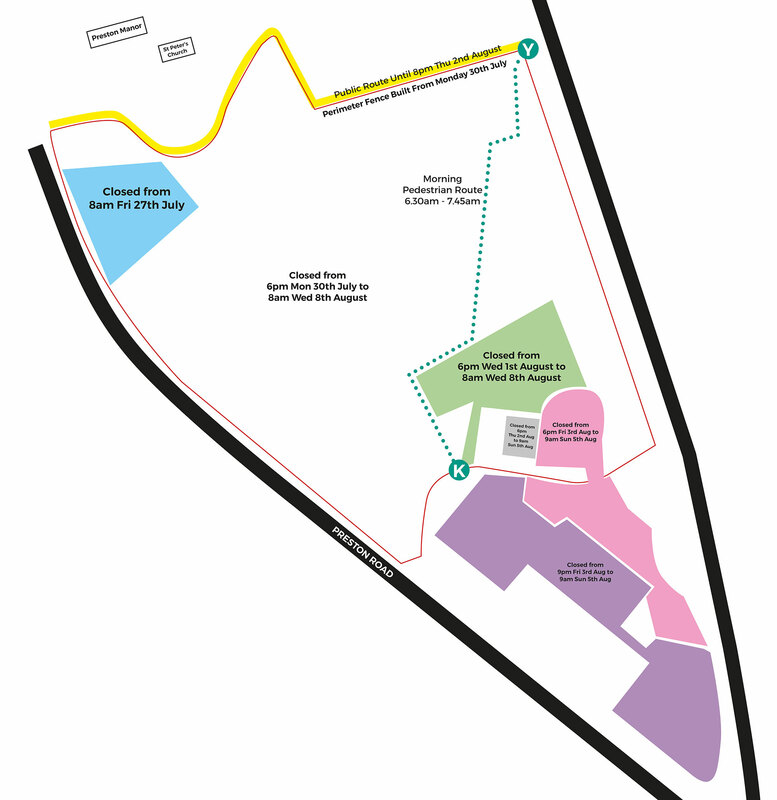 The yellow route is also available for people to go from east to west through the park until Thursday 2 August 20:00. Wednesday 1 August: 18:00 GREEN area will be closed to the public. Re-open at 8am Wednesday 8 August. The south east end of the park including the basketball courts, children’s playground, tennis courts, bowling green, rose garden will be open. There will be fencing going up but areas still in use. will be closed. These will reopen on Sunday 5 August at 9am. Saturday 4 August: We will be fencing around the rose garden (PURPLE) on Saturday 5th August to protect the flowers and we are pleased that the Rotunda cafe are working with Pride this year. Sunday 5 August: The rose garden, Rotunda, bowling greens and tennis courts will re-open to the public at 9am. The remainder of the park will be closed for Love BN1 Festival. After the event, the team work really hard to get the park open and back to full use as soon as possible and we reverse the phases. We will be opening the children’s playground, tennis courts and wildflower garden ready for use on Sunday morning. The GREEN area will be open by Wednesday morning. Monday 6 August: Event de-rig continues – pedestrian walkways in operation (Gate Y to Gate K). Tuesday 7 August: Event de-rig continues- pedestrian walkways in operation (Gate Y to Gate K). You can see the dates and times of restricted park access during Pride week on the above map. For road closure information, click here. The Pride Village Party (PVP) 2018 is once again being run and managed by Brighton Pride Community Interest Company (CIC) with the full support of Brighton & Hove City Council. Thanks to strong support from the whole community and local businesses, we are delighted to say that this years PVP will take place on Saturday & Sunday 4th & 5th August. Our aim, as always, is to produce a safe well managed event and to minimise, as much as possible, any inconvenience and impact on local residents and businesses. Our main priority is to ensure that all residents have access to and from their homes during the time that the event is taking place. 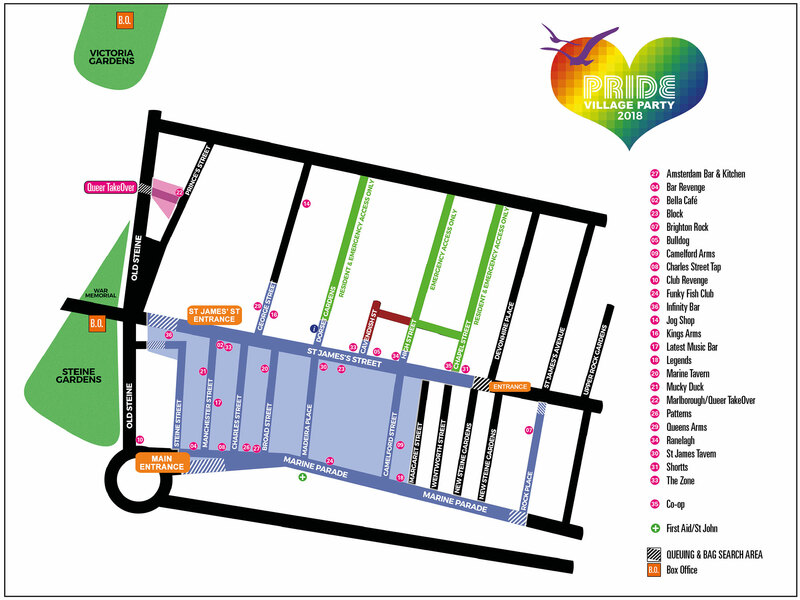 As in 2017 Pride will distribute residents’ wristbands from Monday 9th July however some residents who share their letterbox with others flats will be asked to come and collect in person. We will still need to ask for some form of proof of residency when issuing wristbands and would ask that you have this to hand when receiving your wristband This is to ensure that those residents who live in the affected streets get the wristbands to which they are entitled to enable them freedom of movement within the Pride Village Party area. We will also have a dedicated box office manager to issue wristbands to residents. If collecting from the box office please bring ID when collecting wristbands at the box office to help us to speed up the process. There will be a dedicated residents window but we do urge you to collect early in the week to avoid the many other people who will be collecting on Friday and Saturday. Sunday box office relocates to Old Steine : 1pm-8pm. We also appreciate that Pride weekend is a popular time to hold house parties. To this end we will assist as much as possible, and we are able to offer an exclusive residents’ discount rate for the purchase of additional wristbands for the Pride Village Party at £10 each or Pride will supply you with special invites to provide access for you to give to your party guests in advance so that they can get to your home easily. These cards can be exchanged for wristbands at the reduced price at the box office located on Victoria Gardens if your guests want to attend the PVP too. Wristband sales help us to cover the significant costs of staging the event and putting in place the statutory infrastructure required to ensure the utmost safety of the public.